Join us this summer in the beautiful hills of Montana! 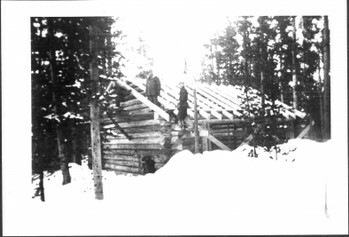 The historic Kings Hill Cabin is located on the Helena-Lewis & Clark National Forest, between Great Falls and White Sulphur Springs. It was constructed in the 1930s by the Civilian Conservation Corp (CCC) and has been fully restored by the US Forest Service for public use in its cabin rental program. However, the associated garage was constructed at the same time as the cabin and, although some restoration (crown log replacement) has been completed, it has suffered the tolls of age and weather. This year, with your help, the US Forest Service regional historic preservation team intends to complete the crown log replacement project. The work may sometimes be difficult, definitely sweaty and dirty, but a lot of fun! See you in August!